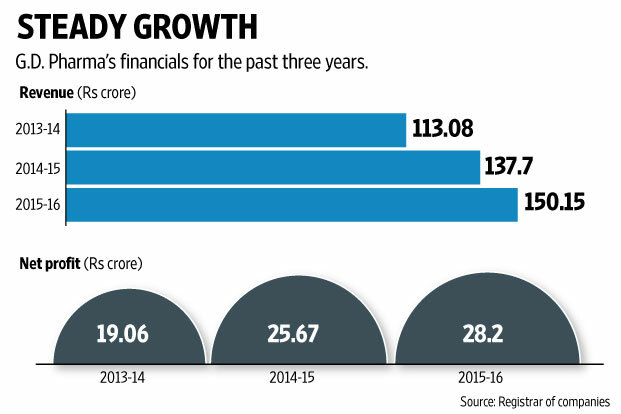 Kolkata: The familiar green tube is yielding ground to a tiny tub, and an antiseptic skin lotion is racing ahead to catch up with the sales of the flagship cream, but at Kolkata’s GD Pharmaceuticals Pvt. Ltd—the maker of Boroline cream—there is one constant: the management’s commitment to build on the goodwill of the 87-year-old brand. Launched in 1929 as an alternative to imported creams, Boroline is recognized as one of India’s strongest consumer brands, but GD Pharma has leveraged it selectively to sell only two product lines nationally. The reclusive Dutta family, which owns the firm, has always been known to be conservative. Yearly revenue of Rs150 crore is underwhelming for a brand of Boroline’s equity, according to Roopen Roy, founder and chief executive officer of Sumantrana Llp—a consulting firm. Debashis Dutta, managing director of Boroline-maker GD Pharma, and grandson of the company’s founder Gour Mohan Dutta. Photo: Indranil Bhoumik/Mint“It’s punching below its weight,” says Roy, a former managing director of Deloitte Consulting India Pvt. Ltd. Indeed, Boroline is a well-remembered if not popular brand, one whose jingle, Khushbudar (scented) antiseptic cream Boroline, was (and is) an earworm of some note among Indians of a certain generation. But small is beautiful for GD Pharma, which is more focused on efficiency and product quality than headline numbers, says Debashis Dutta in a rare interview as the company’s managing director. That’s been the way for Bengali businesses for the past couple of centuries, says Mani Sankar Mukherji, author and historian. Dutta, 44, is the grandson of founder Gour Mohan Dutta, a nationalist who cut his teeth as an importer of foreign goods. To celebrate India’s Independence from British rule, the company gave away 100,000 tubes of Boroline free on 15 August 1947. A simple formulation containing boric powder, zinc oxide, essential oils and paraffin, Boroline has not changed over time. Its formula is hardly a secret, says Dutta. Still, several attempts to copy it have failed, although counterfeiters remain an irritant. Bengalis have traditionally been passionate about their businesses and “obsessed with quality”, says Mukherji, but also “extremely conservative” when it comes to scaling up. There’s a historical reason for it, according to Mukherji. As a community, Bengalis lost a lot of wealth, trading in partnership with the British. After a spate of bank failures starting in the first half of the 19th century, many were hauled to Kolkata’s dreaded debtors’ prison, and the community turned to parking its surplus in only safe haven assets, Mukherji says. For many years, the company had only one product—the Boroline cream—and that was entirely by choice. Products were always developed internally and there was only one way to grow, organically, says Dutta. So, even with Rs110 crore in cash, this debt-free company is looking to push sales only by expanding its distribution network and product innovations. After years of consolidation, GD Pharma started to diversify again in the late 1990s with the launch of Eleen hair oil, a product designed to cater to the West Bengal market. But it was Suthol, an antiseptic skin liquid launched in 2003, which raised the bar. With sales now growing at 20% year-on-year, Suthol contributed about 30% of GD Pharma’s Rs150 crore revenue in 2015-16. The company earned Rs28 crore in net profit, up from Rs25 crore the previous year. Boroline still accounts for about 60% of GD Pharma’s revenue, but Suthol is growing faster. Both are produced at GDPharma’s 25-acre factory at Joka on the outskirts of Kolkata. Because their sales are seasonal—the cream sells more during the winter, and Suthol, more during the summer—the same unit can easily balance the production of the two different lines. The relatively smaller Ghaziabad factory only produces the cream. “GD Pharma brings to my mind what in Germany is known as Mittelstand,” says Roy of Sumantrana. These are medium-sized companies, which are “invariably” family owned with “one or two product lines”, but they are known for their customer-focus and quality of products. Companies that fit into the Mittelstand category work with a long-term perspective—they don’t chase growth quarter-on-quarter, says Roy. They have a lean structure for better cost management; they focus on customer satisfaction; and they run their businesses keeping an eye on social responsibility. Because of the way they ply their trade, some of these companies have been in business for hundreds of years, says Roy. GD Pharma appears to be treading the same path.